Bengaluru, April 6: Winning is a habit and the Royal Challengers Bangalore (RCB) are currently just not being able to get into that mode. Despite dominating three-fourth of the game against the Kolkata Knight Riders (KKR), Virat Kohli and his boys ended up on the losing side as KKR romped home with five balls to spare at the M. Chinnaswamy Stadium here. 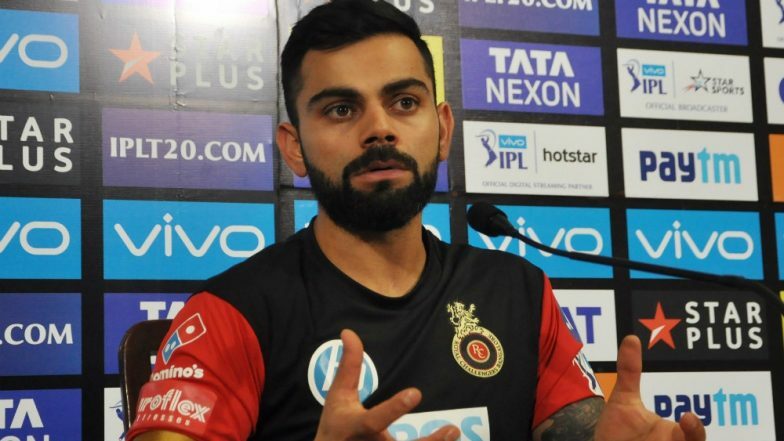 Speaking after the game on Friday, a distraught Kohli said that the poor show by the RCB bowlers in the last four overs was just unacceptable and the team needed to get their act right as early as possible. "There is no guessing there (about where they lost), the last four overs that we bowled was just unacceptable. If you can't defend 75 in the last four overs, then I don't know if you can defend 100. We needed to be more clever, nothing came off and we just cracked under pressure. That's been our story this season so far. If you bowl with not enough bravery in the crucial overs, it's always going to be difficult against power-hitters like (Andre) Russell," he said. Funny RCB Memes Go Viral As Andre Russell Onslaught Shocks Virat Kohli & Co. in IPL 2019 Match 17. Kohli hit a brilliant 49-ball 89 and also became the highest run-getter in the Indian Premier League (IPL), but the skipper felt that he should have carried on and finished the innings as that would have helped them put on some more runs on the board. He felt AB de Villiers too didn't get enough strike towards the end of the innings. "I wasn't really happy getting out at that moment, could've got 20-25 more. AB didn't get much strike in the end. I thought the runs were enough on the board, we didn't have enough composure." The skipper pointed that while the team can have a chat on what was going wrong, it was also important to let the boys breathe and come back strongly as RCB are still alive in the competition. "We can have a bit of chat about what went wrong, apart from that nothing much you can say. I don't think talking enough helps all the time. You need to give the guys some space and come back stronger in the next game. It's been a disappointing season so far, but we are still optimistic about our chances. We just have to believe in ourselves that we can turn things around," he added.